This free tool can redirect, resend or forward selected Outlook messages. 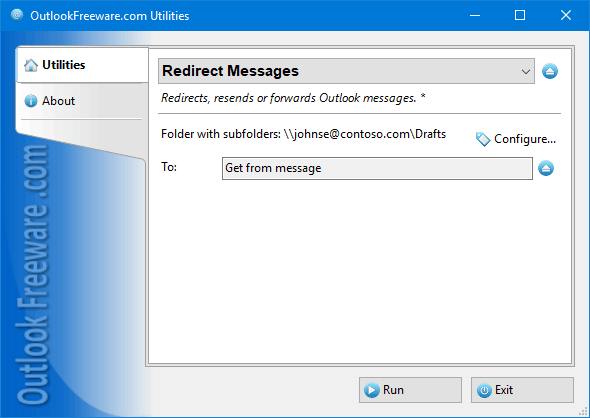 This free utility allows you to forward, redirect, or resend Outlook email messages with additional features. Just specify the folders with the original messages to be forwarded or select them, select the desired account, sender, recipients, edit subject and text of the forwarded messages, and run the utility. During execution, the utility will send a new message based on each source message, changing all the specified fields. In addition, the utility can delete the original message, if necessary. Unlike the standard Outlook forwarder, the utility will not quote the original message by adding a header. If you need to, you can create a header by using text and macros. The unique feature of the utility is the ability to use HTML tags in message texts. - Forwards, redirects, or resends Outlook emails with one click. - Allows you to change email account, sender, and recipients (including "To", "Cc" and "Bcc"). - Allows you to change the subject of the message and the text of the message, replacing the text completely or inserting a fragment at the beginning or end of text. - Seamlessly integrates into Outlook rules, enabling you to forward incoming messages automatically with advanced settings. - Supports HTML formatting of message texts. - Expands macros in message subjects and texts using the data of the original message. - Provides a command line utility for automating in various scenarios and running on a schedule. Support for integration with Outlook rules and command line opens up additional possibilities for automating forwarding and redirection, using in batch files, scripts, running by schedule in Windows Task Scheduler, and other scenarios.